This medium-sized species is found in several rivers of the northern portion of the Indian peninsula. 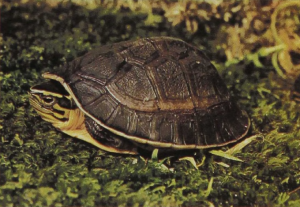 It is a true pond turtle, being highly aquatic and coming to shore only to bask or to lay eggs. They feed on aquatic snails, which they recognize by sight or smell and peel out of their shell before swallowing. To do this the turtle first crushes the snail, then alternately distends and constricts its throat, flushing water into and out of the mouth. This washes the fragments of broken shell away from the soft parts, which are held loosely by the ridges of the half-opened jaws and swallowed when clean. 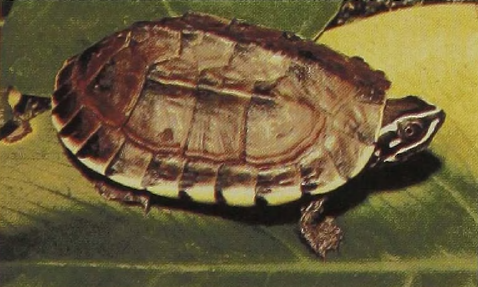 The juveniles are particularly attractive because of the clear yellow bands along the sides of the snout.